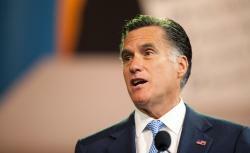 Mitt Romney: lying about leaving Bain Capital in 1999? Bain Capital continues to be a drag on Mitt Romney’s campaign. SEC filings uncovered by the Boston Globe show Romney remained Chairman, CEO, and sole owner of the private equity firm until 2002, three years after he claims to have left. Romney’s stated departure from the company in 1999 was convenient timing—supposedly absolving him of being responsible in any way for companies owned by Bain that went bankrupt or suffered massive layoffs afterward. With Romney being paid at least $100,000 as an “executive” at the company during 2001 and 2002 in addition to income from investments, that timeframe is called into question. A story in the Boston Globe raises new questions about the timeline for GOP presidential hopeful Mitt Romney’s departure from Bain Capital. The Obama campaign has already jumped on the story, suggesting it only adds to troubling questions about Romney’s avoidance of releasing information on tax returns and offshore assets. The Romney camp has repeatedly said the GOP candidate “has not had any active role with any Bain Capital entity” since 1999. If only more of us could get paid six figures for doing nothing.